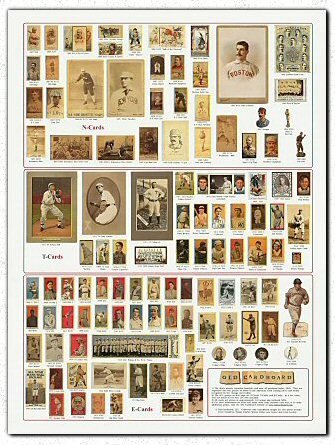 Old Cardboard has produced two quality prints that display examples from some of the most popular vintage baseball type-card groups. Each print measures 18 inches wide by 24 inches high. Each print functions as a handy vintage card reference and set identification gallery. The prints are designed to fit into a standard-size poster frame and provide a colorful decoration for any office or game room wall. A variety of frames are readily available from major national department retailers or at your local hobby or framing shop. 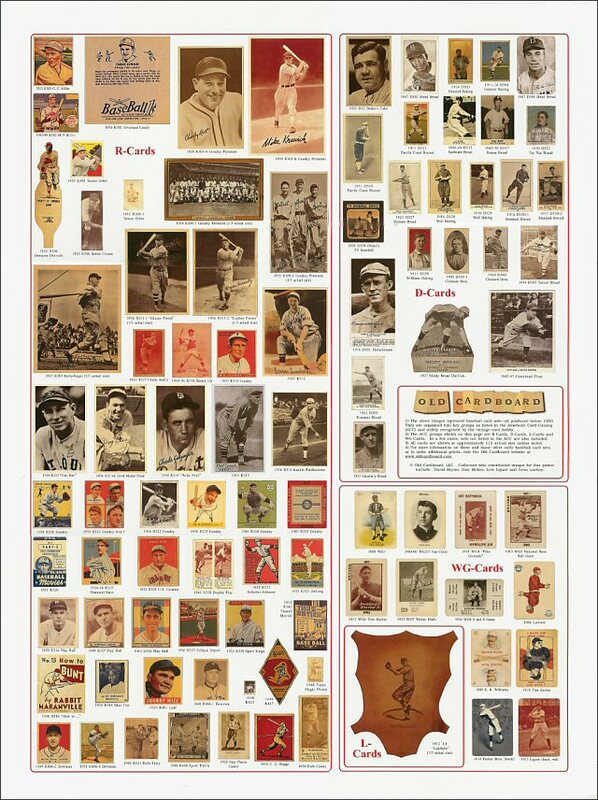 The framed prints also make ideal reference charts for display in baseball card shops that sell pre-1950 cards! 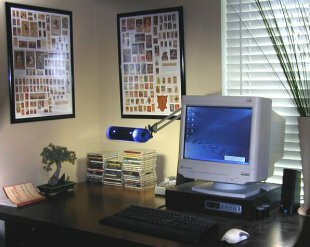 The first print displays over 100 cards from the N, T, and E card groups as referenced in the American Card Catalog (ACC) and widely used by vintage card collectors. Cards from other key ACC groups (R, D, L and WG) are featured on the second print. The image from each card set is labeled with the date of issue and the set's ACC number. As appropriate and where space permits, a brief set title is also provided. With only several exceptions (chiefly for oversized cards which are shown at one-third actual size), all examples on both prints are scaled to approximately one-half actual size, thus also providing an effective card size reference. 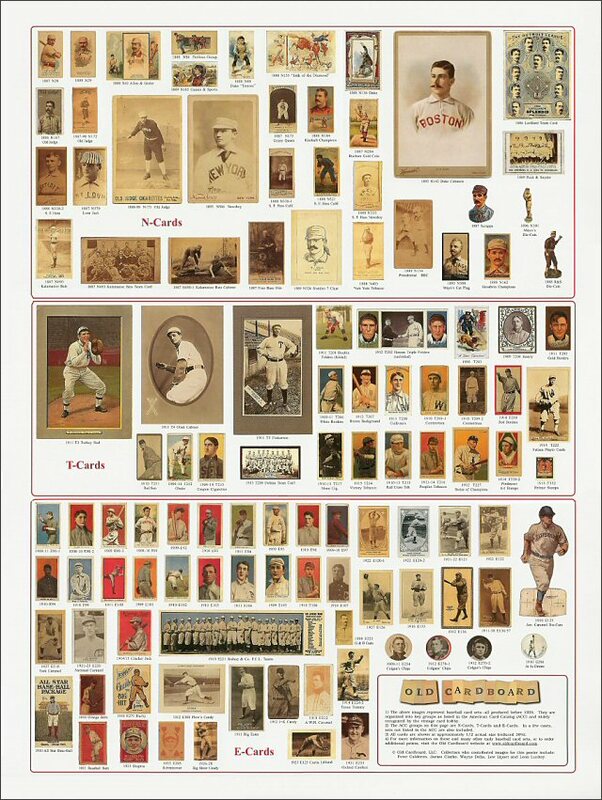 Together, the prints display examples from more than 200 vintage baseball card sets. The most recent card displayed was originally distributed in 1950. More than half of the cards shown, however, were produced before 1925. Yes, both quality prints can be purchased for $19.95 plus $5 shipping ($24.95 total). The prints are rolled (unfolded) and shipped in sturdy three-inch mailing tubes. In most cases, the prints are shipped within 24-48 hours after we receive your order. attached form and mail it to the address provided. 1) Either print can also be ordered separately for $14.95 (we pay shipping & handling). 2) Card Shop quantity discounts are available for orders of 10 sets or more. 3) For details or questions, please email us at brett@oldcardboard.com. 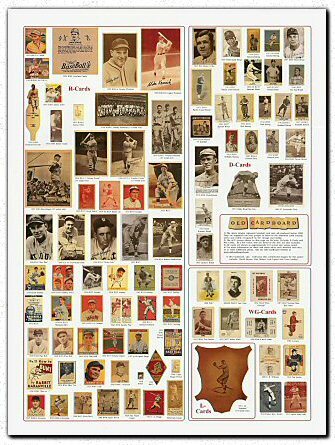 We appreciate your support for Old Cardboard products and for your interest in the vintage baseball card collecting hobby.